Be the first to share your favorite memory, photo or story of Carmen . This memorial page is dedicated for family, friends and future generations to celebrate the life of their loved one. 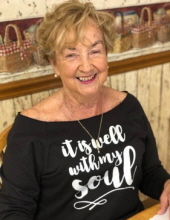 Carmen E. Medlin, age 81, of Sullivan, MO, passed away while in her favorite place, Marco Island, FL, while watching tennis with her husband, on January 19, 2019. Carmen Erline was born on December 4, 1937 in Lamar, MO, the daughter of Earl and Thelma (Rose) Frogge. She attended and graduated from Lamar High School. She married her high school sweetheart, Gerald Medlin, on August 18, 1956. They established and successfully ran Ditch Witch in Sullivan until retiring in January 1989. Carmen was a member of Sullivan Christian Church and was very involved. She enjoyed meeting with The Ambassadors group and helping with various church activities. She loved to sing, travel, cheer on the St. Louis Cardinals and spend time with her family and friends. In addition to her husband of 62 years, Carmen is survived by her three children: Cheri Cason of Green City, MO, Greg Medlin and wife, Beth, of Omaha, NB, and Grant Medlin and wife, Becke, of Bourbon, MO; seven grandchildren and eight great-grandchildren; two sisters, Wilmetta Jeffries of Lamar, MO, and Jeanette McColm and husband, Larry, of Kansas City, MO; one brother, Larry Frogge and wife, Marsha, of Mountain Home, AR; and three sisters-in-law, Phyllis Bishop and husband, Louis, of Rogers, AR, Zoe Caywood and husband, Charlie, of Hindsville, AR, and Pam Kaderly and husband, Rick, of Lamar, MO. She was preceded in death by her parents; and one brother, Wayne Frogge. A Memorial Service will be held 2:00 PM, Saturday, April 13, 2019 at Sullivan Christian Church, 912 MO-185, Sullivan, MO 63080, with Pastor John Blackmore officiating. In Lieu of Flowers, expression of sympathy may be made to: Sullivan Christian Church or St. Louis Christian College. All arrangements were under the care of the Eaton Funeral Home of Sullivan & Bourbon, MO. To send flowers or a remembrance gift to the family of Carmen E. Medlin, please visit our Tribute Store. "Email Address" would like to share the life celebration of Carmen E. Medlin. Click on the "link" to go to share a favorite memory or leave a condolence message for the family.